I always enjoy good food-related humor. 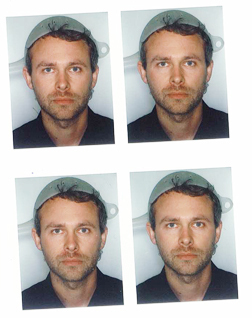 So when my mother forwarded me a link with the subject line, “Austrian Man Wins Right To Wear Pasta Strainer In License Photo,” I couldn’t resist taking a moment from my busy day and clicking through. According to the story featured on the NPR website, a Viennese man named Niko Alm had been petitioning the Austrian government for three years for the right to wear a pasta strainer on his head in his driver’s license photo. Now I’ve spent a good deal of time in Vienna, and did meet some colorful characters. You need look no further than the 18th-century Austrian sculptor, Franz Xaver Messerschmidt, to see what I mean. And certainly this seemed to fall in that same tradition. I began to wonder what kind of rituals might be involved in belonging to the Church of the Flying Spaghetti Monster. It would be reasonable to assume worship would take place in your nearest fine Italian restaurant, with votives flickering on each table. But would scriptural readings comprise passages from the writings of Epicurus? When the donation basket was passed, would there be garlic bread in it? And what would constitute a relic? A marinara-stained scrap of the collar from one of Dom DeLouise’s shirts? Delving a little deeper into the story, I discovered that Mr. Alm owns an advertising agency and is an athiest who advocates for a clean separation of church and state, and views the recognition of religious headgear as a tacit endorsement. His next “mission” is to get the Austrian arm of the Church of the Flying Spaghetti Monster officially recognized by the government. Remember Seth Myer Bruin when we were in Austria? Ha ha. I’m actually a Frisbeeterian. We believe that when you die your soul gets stuck up on the roof.